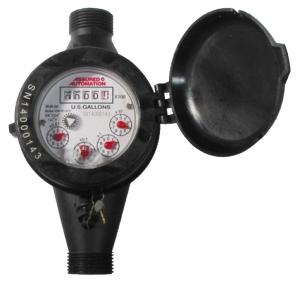 The WM-PC Series plastic water meter by Assured Automation is an impeller style meter available in sizes 1/2″ to 1-1/2″ with a dry type register for use in residential and commercial applications. The WM-PC is designed to meet the new federal regulations that require all products coming in contact with potable water be lead free and is also designed to meet AWWA C708 Standards. Water flows through the meter’s strainer (inlet and internal) and into the measuring chamber where it drives the impeller. A driving magnet transmits the movement of the impeller to a driven magnet located within the sealed register. The magnet is connected to a gear train which translates the impeller rotations into volume totalizers displayed on the meter’s register dial face. Typical Applications include residential and commercial, metering and sub-metering applications. The WM-PC has been used with great success in the industrial segment in food and beverage, plant process water and cement mixing applications. This economical plastic meter is also ideal for residential applications where the WM-PC is used as a Sewer Deduct Meter or Summer Meter to monitor water that is used outdoors and never passes through to the sewer system. Many municipalities will allow home owners to deduct their outdoor water use from their sewer bill. All meters include pipe adapters (2 gaskets, 2 couplings, and 2 nuts) with nuts and couplings made of the same FRP polymer as the main case, except the 1-1/2″ which substitutes brass for the coupling material. Optional pulse output and check valve is available. This entry was posted in Flow Meters, Latest News, New Product Announcements and tagged cement mixing meter, commercial water meter, lead free water meter, pond meter, residential water meter, sewer deduct meter, summer meter, WM-PC Series mechanical water meter. Bookmark the permalink.